alright nah…i c 'em. lookin' real nice!! Girl has it been that long? You look fab as usual!! Thanks everyone and yeah Serving Christ…it's been that long! lol Good to see everyone and hope you all are doing well. Very pretty I have been stalking your blog for a while. I finally started my braidlocks and I am so excited. I have watched most of your youtube videos and started using your recipes. LOL@ Sashalocz! I'm so glad that what I've shared so far has been helpful to you. You have such beautiful hair. The amount of time you put in to you hair shows. It looks professional. Thank you! 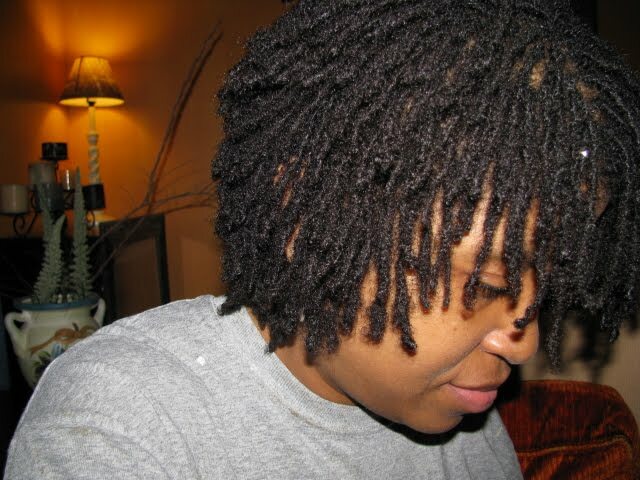 Lately locs have been mistaken for Sisterlocks a lot. I’m already quite proud of my hair but that makes me even more proud of it. I suppose every ethnic group has pros and cons when it comes to hair. At least your hair is strong enough to do just about anything you want to it. That is a definite plus in my book! Oh I wish it were strong. Afro textured hair has so many twists and turns that it makes our hair quite fragile. Every turning point is a potential breaking point. My hair cannot take a lot of heat or chemicals and even though it’s natural it’s still prone to breakage. Keeping it chemical free helps. Wow! I never knew that. I always thought it was much stronger than Caucasian hair. I take a diuretic for a heart condition which pulls all the moisture out of my face and hair. I have to be so careful about using ponytail holders and barrettes. I keep my hair short because it just breaks off anyway. We have to take the same precautions with hair accessories and in particular the standard accepted way of hair care. Hence the natural hair movement that has been underway for the last few years. I kept my hair short for years for the very same reason as you. Making changes in my hair care have made all the difference in retaining length.